… And daaaamn, was it worth it. “NES-inspired” doesn’t do this game nearly enough justice. It’s a complete swan song to a variety of the finest titles in the NES library (Mega Man 2, Ducktales, Super Mario Bros. 3, The Legend of Zelda, Castlevania, Ninja Gaiden, to name a few), incorporating the very best elements of all of them and creating a half perfect allusion, half extremely fresh experience that would make anyone who’s gone toe-to-toe with Dr. Wily or explored maps of the Mushroom Kingdom feel waves of nostalgic bliss. The Mega Man series is the biggest influence here, with a majority of the game’s structure based on that model. The Shovel to his Mega, the Knight to his Man, the titular protagonist must face 8 Knight themed foes in order to find his long lost companion, the Shield Knight, last seen in the clutches of the evil Enchantress. Instead of Dr. Wily’s pack of 8 Robot Masters, the evil knights make up the Order of No Quarter, and pay homage to both Wily’s coolest creations like Metal Man or Crash Man (Specter Knight, Plague Knight) and the hilarious, he’s-definitely-running-out-of-robot-ideas like Pharaoh Man (King Knight). The Mega Man mold is broken with the game’s progression. 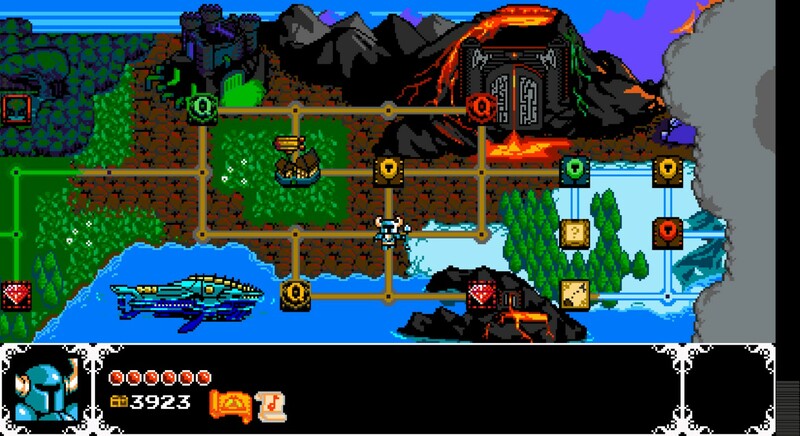 Rather than a choice of what order to attack the eight enemies in, the player explores a map which seems to directly reference Super Mario Bros. 3, complete with random Hammer Bros-type foes wandering around the map. You usually have a choice between two Knights before you can unlock new areas of the map. 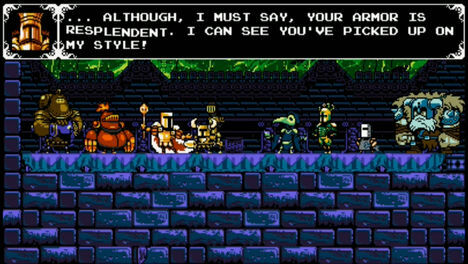 Enemies on each Knight’s stage reflect his theme (yeti-vikings for Polar Knight, demons and skeletons for Specter Knight) and each level comes with its own catchy 8-bit tune. The soundtrack alone is a reason to visit this game. I always wondered if those earworms from Mega Man 2 and so many other great NES games were just lightning in a bottle from the late 80’s/90’s, chiptunes made at the last second to add to a game but accidentally made awesome as all hell. The creators made that magic happen here in 2014 though. I had more that a few of these stuck in my head long after playing. Shovel Knight learned none of his moves from the Blue Bomber, however. Using the shovel as a killer pogo stick a la Scrooge McDuck, slashing at enemies with it as Link would, and chucking items like Simon Belmont or Ryu Hayabusa make Shovel Knight the perfect amalgamation of the NES’ greatest heroes. This makes for diverse platforming stages that require the player to constantly use the shovel for all its different uses, as well as the different items (or relics as they’re called in this game) found throughout the adventure. 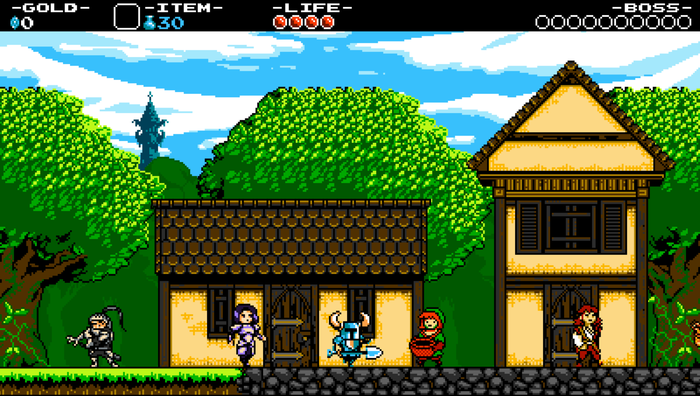 Shovel Knight can always return to the main town on the map to purchase upgrades, return collectible music sheets to the bard (the completionist player will need to scour every stage to find all 46) or talk to NPCs for clues. This area of the game is structured exactly like Zelda II, with townspeople walking back and forth that can be stopped and forced into a conversation with you at any time. Some cool ideas were introduced to the stages themselves that really freshens up the gameplay. Four or five checkpoints are spread throughout each level, but they can be shattered at any time, rendering them useless but incentivizing the matter by rewarding a fistful of jewels to spend on upgrades. I started the game very over-confident and shattered just about everyone I found. Dying at the boss and having to start the stage from scratch soon taught me the lesson that playing a little more conservatively would save me a little more sanity. Dying also results in a unique experience – like Dark Souls, a chunk of your cash is left at the spot of your death. Eventually, in addition to purchasing expansions to your life and magic bar, shovel and armor upgrades become available as well. Shovel upgrades cover everything from shooting a projectile from your shovel when you have full life (Legend of Zelda-style), the ability to dig up a pile of jewels in one stroke rather than several, and the ability to charge a powerful swing attack. 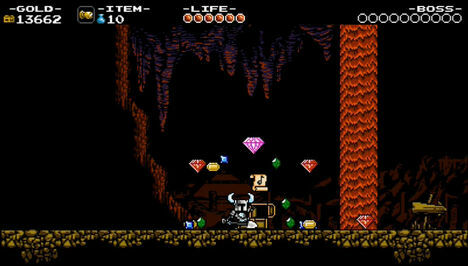 Armor upgrades provide useful powers like dropping less gold in death, sacrificing life for increased magic power and eliminating the frustrating “knock back” (best known from Ninja Gaiden) Shovel Knight endures when hit by an enemy, often throwing him off a cliff when hit at an inopportune angle. My favorite by far was the “Ornate Plate” – the most expensive, the description owns up to the fact that it includes no actual benefits other than looking cool. When jumping, Shovel Knight now rocks a cool mid-air flip and leaves a trail of stars (think Mario while using a star in Super Mario Bros. 3). The stage designs are awesome. 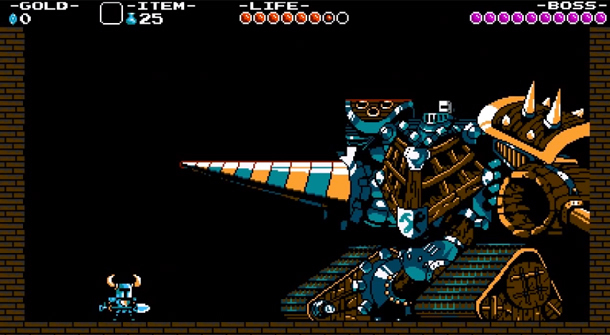 Different challenges mixes up the experience the whole way, such as traversing ice, avoiding pits and spikes (Shovel Knight shares this hard disdain with Mega Man, dying instantly if hitting them) by riding strong winds at the right time, controlling small moving platforms over large gaps, and briefly solidifying fire to create safe travel before the flames return. Again, I spotted Mega Man 2 references and inspirations everywhere. After a stage that felt like an alternate version of Metal Man and an easy pre-battle with the tiny, nervous Tinker Knight, Shovel Knight must face his real form – a giant robotic knight with Tinker Knight behind the controls that would leave Dr. Wily proud. A fire-spouting Griffin at King Knight’s stage seemed like a distant relative of the fire-breathing dog found on Wood Man’s stage. Treasure Knight’s stage brought back the enhanced jumping mechanics Mega Man has underwater (such as Bubble Man’s stage). Magic books that disappear after a few moments are sometimes your only way to cross a gap, and seem like a definite throwback to the disappearing platforms from countless Mega Man levels such as Heat Man’s stage. The humor in the game is also spot-on. 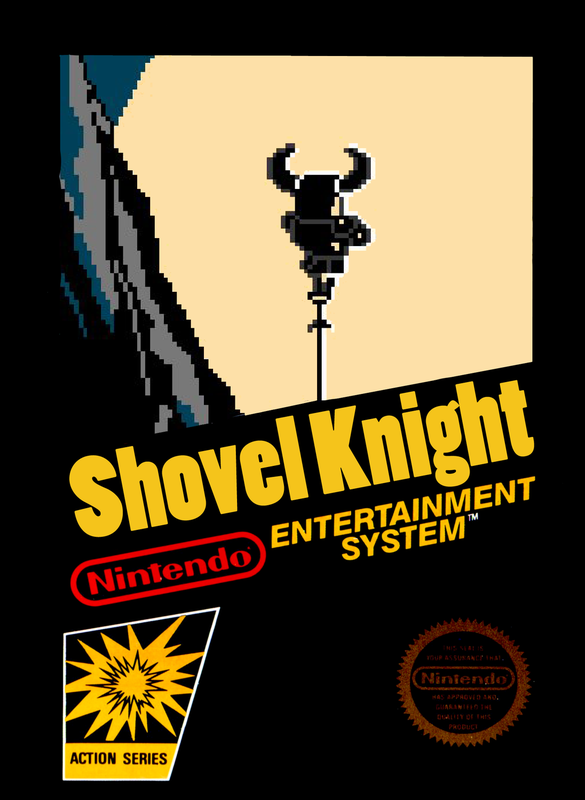 Mole Knight, faced after finishing an underground-themed stage, laughs at Shovel Knight’s “digging apparatus.” The giant Polar Knight, who wields an enormous snow shovel, alludes to a past friendship with Shovel Knight (presumably based on their similar weapon choice) and implores him to join the Order of No Quarter. And just the name “King Knight” had me laughing before I even started. After purchasing all the upgrades you could want, exploring extra stages that serve almost as side quests and fighting optional (I think?) 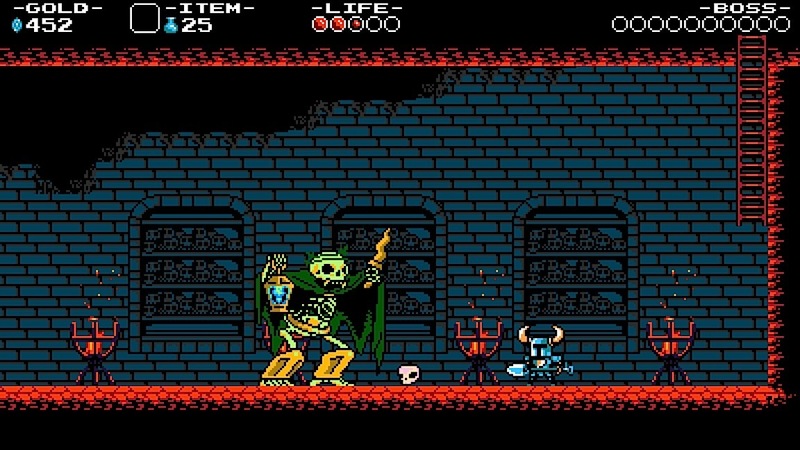 bosses, Shovel Knight is ready to face the Enchantress herself at the Tower of Fate. Before the final battle, the player must get through two stages of the Tower, which contain the hardest platforming challenges in the game, much like Dr. Wily’s fortress(es). Upon reaching the end, another Mega Man tradition must be completed. I was embarrassed I didn’t see this one coming – the rematch with the 8 Knights. I always loved this part of the Mega Man games – the boss fights are the most enjoyable parts of the games usually, and before the final boss, the player must prove they could still dance with each robot master one more time. I wanted a little more challenge on Shovel Knight’s take on this – upon defeat, each boss yields a turkey which will grant full life. Robot Masters in Mega Man give life, but not a full bar. And in Shovel Knight, you fight them all in the same room, one at a time. So if you don’t need the life, you can leave it on the stage and consume it mid battle. It left the battles pretty easy to get through, and I didn’t really need to use the strategies I had developed for each one; jumping around and slashing haphazardly usually did the trick. But still, beating them all again and listening to their individual quips once more was a great way to round out the experience. The final battle is challenging enough, but could probably have used a little more difficulty. It’s execution is perfect, with Shovel Knight requiring the assistance of the long sought-after Shield Knight. The credit sequence is a throwback to Super Mario World, A Link to the Past and countless other videogame mainstays: a tour of the entire world map, with enemies and friends seeming to now live happily in unison in their respective environments. The story ending I got seemed happy enough, but I was pretty sure going into it I was going to receive a crappy one – after every two or three stages, Shovel Knight has a dream in which he must fight off foes and catch a falling Shield Knight. I was typing away on this blog for one of them and missed it. Although I was pretty pissed about it, it now leaves another reason to return to this great game and see what I missed. Speaking of replay value, there’s plenty of it besides the killer gameplay. You’re granted a “New Game +” for finishing the story, in which you start from the beginning with all your upgrades and new equipment in tact. The catch is the experience is tougher this time around. I’ve started it, and it seems like a more realistic NES experience. I’ve noticed new dangers added to the stages already, and the checkpoints are fewer and far between. Clearly, I can’t recommend this game enough. If you’re a new gamer and never touched the NES, it’s a unique experience that will test your platforming skills without all the hand-holding that is sadly expected in games created today. If you grew up in the NES era, you’d be crazy to miss this one. The $15 price tag becomes a no-brainer once your immersed in this pure nostalgia, NES fantasy come to life. I only hope Yacht Club Games creates more of this magic and inspires other developers to follow the trend of reviving and honoring vintage video games. Love this! hope see more of this blog on my feed. cheers! Thank you friend! Glad you enjoyed!